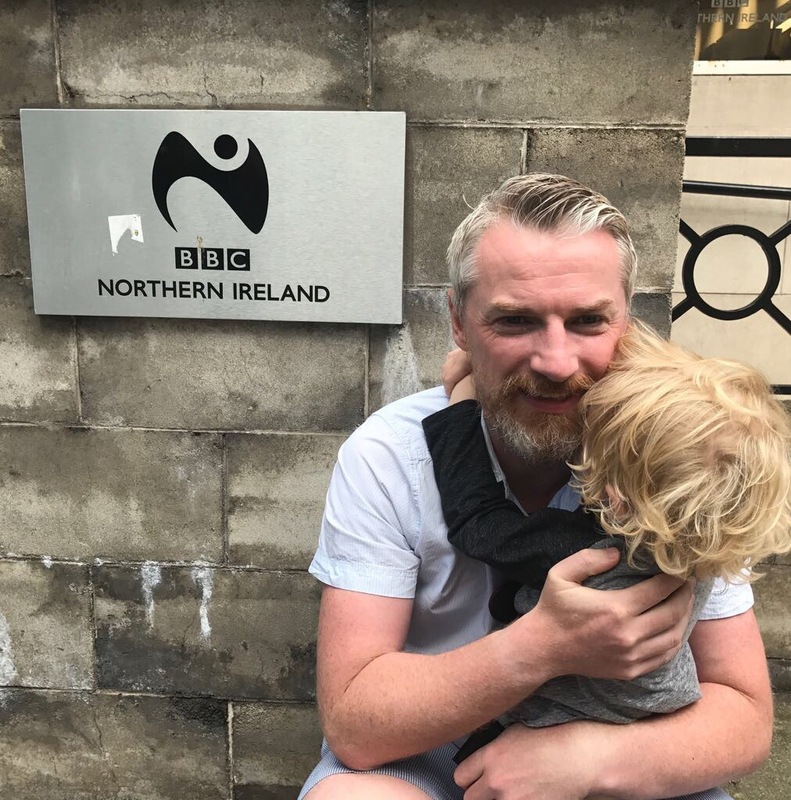 Back at the Beeb | What's a daddy for? No, I can’t believe they let me back in the building either. But then again, maybe I’ve found my broadcasting niche. Last week they wanted me to talk about how I’m so hard-hearted that I leave my son in a crèche even when he gets upset. This week it’s why I’m so irresponsible as to share photos of my child on social media. Inevitably they will have another parent going up against me on air to argue why she would never take the risk of putting a picture of her child online. I’ve a feeling I’m being pigeonholed. I imagine there’s a big book somewhere in Broadcasting House with my number stored under G for ‘Godawful parent’. Anyway I’m back in the green room waiting to go on Radio Ulster again. It’s practically my second home now (but still no jelly). It’s Evening Extra I’m doing this time. I’ll be interviewed by Seamus McKee, a broadcaster and journalist I’ve admired since my youth. We’ll be talking about ‘sharenting’, a word that makes me shudder each time I have to say it. I’m told author and columnist Lucy Mangan will be giving the other side of the argument. I’m beginning to worry it won’t be a fair fight. She’s got 54,000 Twitter followers. I’ve got 13. She’s won awards for her writing. I got second place in the egg and spoon race when I was in P6. My mind wanders to an alternate universe. I’m sitting in the studio of the Jerry Springer Show. Lucy Mangan is sat beside me. Jerry introduces the topic, that phlegmatic half-smirk permanent on his lips. Before I can go any further Lucy Mangan interrupts me by shoving her hand in front of my face. Lucy Mangan is now wagging a finger in front of my nose. My mind returns to focus. I’m led into the studio. Seamus is there. So is…..John Campbell! John Campbell, BBC NI Business Editor. John Campbell who I last week described in a blog as having a scowl like a little boy who has been told he can’t wear his Spider-Man wellies to school. I sit uncomfortably beside him. For the first time ever I’m hoping that someone hasn’t read one of my blogs. The population of Northern Ireland is 1.8m. That blog was one of my most popular, it was read about six times. I subtract the three times that I clicked on it. I’m trying to work out what are the odds that John Campbell might have read what I wrote about John Campbell. But the truth is you’d need to be John Campbell to figure out the maths. He’s talking to Seamus about Brexit. I try to follow the argument and nod knowingly a couple of times. But soon I’m lost and I start to wonder what the implications would be if I gave John Campbell a wedgie while he’s live on air. I decide against it. He gives me a quick look as he leaves the studio but it tells me nothing. Then I’m broadcasting to the nation again. Lucy Mangan is lovely and not at all confrontational. Indeed it seems that we’re mostly making the same arguments, but just coming to different conclusions. This has the strange effect of being both reassuring and making me feel intellectually illiterate. Seamus is polished and professional as ever, not even missing a beat when I accidentally eat part of my microphone after the first question. As ever it all passes in a blur. My wife and son have made the trip to Belfast with me because we’re going for pizza afterwards. When I return to the car my son overwhelms me with hugs and kisses. He just about understands what is happening, that daddy was on the radio. Mummy tells me he almost burst with excitement when I mentioned his name on air. Of course he doesn’t entirely understand the concept of the radio just yet. He can hear me but doesn’t know why I can’t seem to hear him.